The Neo-Pure PS-27200-S35 Standard Efficiency Pleated Filter is constructed out of 5 square feet of pleated polyester media wrapped around a polypropylene core for added strength and the ends are immersed in a thermo-setting vinyl plastisol. The polyester media reduces sediment, and provides excellent resistance to chemicals and bacteria. Reduces Sediment and Rust. The Neo-Pure PS-27200-S35 filter is manufactured using pleated polyester for improved reduction of sediment, dirt and rust. Perfect for Residential, Commercial and Industrial Filtration. The PS-27200-S35 is ideal for use as a reverse osmosis prefilter. It's large surface area make this filter perfect for drinking water and filtration in residential, commercial and industrial applications. Pleated Filter Design. The pleated filter design of the PS-27200-S35 offers an extended filter area to provide high flow rates, low pressure drops, and increased dirt-holding capacity. Polyester Media and Polypropylene Core. Polyester is a non-cellulose fabric; this material provides excellent resistance to bacteria and chemicals. The polypropylene core is durable, extending the life of the filter. High Value At A Competitive Price. 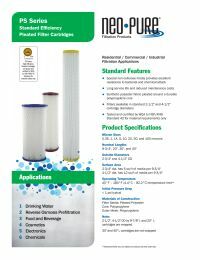 The Neo-Pure PS-27200-S35 filter cartridge offers an economical and competitive price while providing	exceptional performance and high bacterial resistance. WQA Certified. The Neo-Pure PS-27200-S35 is tested and certified by the WQA against NSF/ANSI 42 Standard for material requirements. Surface Area: 10 sq. ft.